Now Is a Good Time for That Chimney Inspection! | 2nd Generation Chimneys, Inc. Animals Will Seek Shelter in Chimneys This Winter! You do not need us to remind you that the biting cold of the winter season is coming. Nonetheless, we want to remind you that the biting cold of the winter season is coming! If you are anything like the rest of our clients, then you are eager to start firing up the, well, fires in your fireplace. And you certainly do not need to wait for winter to officially start before doing so. You do, however, need to wait until you’ve had your chimney inspected before doing so. Now, we know what you may be thinking. Hey, I’m lookin’ right at my chimney—and it looks fine! We don’t really want to remind you that looks can be deceiving. Nonetheless, we want to remind you that looks can be deceiving! You need to have your chimney swept out every year, and a level 1 chimney inspection in Minneapolis, MN should always be a part of that service. However, there is really more to chimney inspection to this. A level 1 chimney inspection is important, and must be completed by a trained professional. As mentioned above, this should be your bare-minimum for yearly inspection. However, it is really just the first tier in the inspection ladder. We’ll check the structure of the chimney as well as your liner for obvious issues, and the outside of the chimney will be visually inspected, too. If you’ve made a change to your home, your selling your house, or there has been a major natural event, then a level 2 chimney inspection is suggested. Flue size will be evaluated, clearance levels checked, and much more. A level 3 inspection is very comprehensive, and may even involve removing the crown of the chimney for a thorough look. This is really only done when absolutely necessary, but you should definitely inquire with us if you have major concerns about your chimney. We mentioned above that we’ll look at chimney structure and liners for problems, but that too is just the beginning. During an inspection, our technicians will look for creosote buildup, as well. This sticky substance builds up within chimneys, and really creates a fire hazard. Cracks in the masonry will also be noted, with necessary repairs suggested, and we’ll even check to make sure that everything has been properly installed to guarantee proper airflow while minimizing heat loss. When all is said and done, your chimney and fireplace can never be too safe. It can never be too efficient. And that means that it can never be too well inspected—but we’ll certainly give that a run for its money! We are the chimney inspection professionals that you can turn to for honest assessments and honest answers. If problems do arise, we’ll make sure that you’ll understand why we’re making the suggestions that we are. That way, we’ll all be on the same page as we move into the next step of the process. 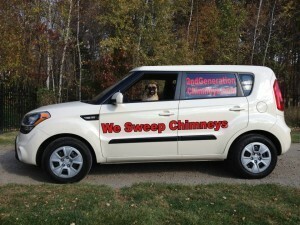 Schedule your chimney inspection with 2nd Generation Chimneys, Inc.